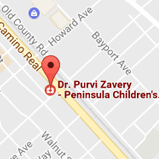 Click here to read the latest certified testimonials by parents regarding Dr. Purvi Zavery and the practice. We are grateful for so many positive comments and feedback. We are happy to have made a positive difference in children’s dental health and created a lifetime of healthy dental habits. You can also find reviews about the practice on Yelp. We were also rated "Best of the Best" by the Bay Area Parent Magazine. Below is a sampling of additional parent testimonials provided to our office. My kids run into the examining room when it's their turn. That basically speaks volumes to the experience we always have. 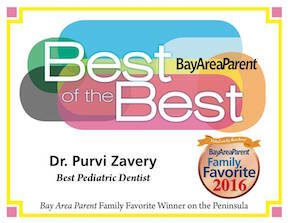 "Dr. Purvi" as my kids call her is knowledgeable, compassionate, patient, and fun, everything we need in a dentist. TV screens are a fun treat, too. I wish they had hearts instead of stars to rate her. Dr. Zavery and her entire staff are amazing. She is so patient, gentle and I like how she involves me, as the parent, explaining things and showing me how to watch for changes in my son's mouth. She really does a fantastic job of being thorough. She has a high level of compassion for her patients and their family. My daughter had a great visit! We arrived early. There were toys in a play area which helped her get used to her surroundings. Then Dr. Purvi came out and went over what the 1st dentist appointment was all about. We walked to the dentist chair. She showed my daughter how the chair worked. She spoke to her in a nice tone and in full sentences. My daughter really trusted her. Don't get me wrong, she was nervous, but b/c the doctor was so friendly and described everything and showed her how it worked before she used it she was much more at ease. There is even a TV playing cartoons above the chair. There was a toy drawer which my daughter picked out a dinosaur and has been playing with it ever since! It was a great 1st appointment! Thank you Dr. Purvi for another excellent visit! My kids have been motivated to floss after our last visit. They love going to the dentist and we are very thankful for you! Another successful visit! The kids love coming here for their cleanings. Dr. Purvi is always thorough, never rushes and takes time to explain every step. She helped calm our daughter and did a great job with the extraction! My boys are treated so well that they have no fear of the dentist and look forward to flossing! I'm SO impressed with how Dr. Purvi and her team handle our sensitive, shy girls. She is incredibly thoughtful about how she puts her schedules together, ensuring families are rushed nor having a busy, overwhelming office. Great dentist. My kids love going there. Since I'm still nervous now about going to the dentist myself because of bad childhood experiences, I appreciate that fact that my kids don't have that at all. Dr. Zavery is super nice with the kids, and the fact that they have Tv screens over their heads makes it a fun experience as opposed to a traumatizing one. Dr. Purvi and her assistant are great! They make my son feel welcomed every time and looking forward to his next visit. Warm, gentle and professional staff. Dr Zavery is great! Dr. Purvi was able to fill my daughters tooth with just laughing gas and no shot. It all went very smoothly and quickly. Dr. Zavery is wonderful with both children and parents. Would recommend her in a heartbeat. No waiting time. Personnel are professional. Excellent care provided by Dr Zavery. She is so good with my kids and they love coming to her office. It's a great dental office for kids, not scary at all. My girls actually enjoy their teeth cleaning and coming to the dentist is not frightening. This is a great place for kids to be introduced to dentistry and not be fearful. We are very happy with Dr. Zavery and she will be our girls dentist for years to come!! Everyone (the receptionists, hygienists, Dr. Zavery) was all super nice and friendly. Dr. Zavery took the time to answer all of my questions. I wish she would see adults, too! I highly recommend her. We love Dr Zavery and her staff! My kids look forward to going to the dentist!!! Dr Zavery is kind, caring, and my toddler daughter is not scared of the dentist because of her chairside manner. I'd recommend her to anyone. Dr. Zavery's staff is very friendly and knowledgeable. Dr. Zavery and her staff are always gentle, kind, realistic and very communicative. With three kids as patients, I have been going to her office for over 8 years and she has ALWAYS been on time. We have had at least 2 dental emergencies over the years and she has been dedicated to solving the issues as though my kids were her own children. We are so lucky to have found her! A+++, Dr. Zavery is fantastic!! My boys love going to the dentist. A great educational visit as always!